For an ever-growing grocery store chain, New Seasons Market is pretty responsive. Don’t see your favorite crackers? Chances are they’ll either start carrying them or tell you why they don’t or can’t. 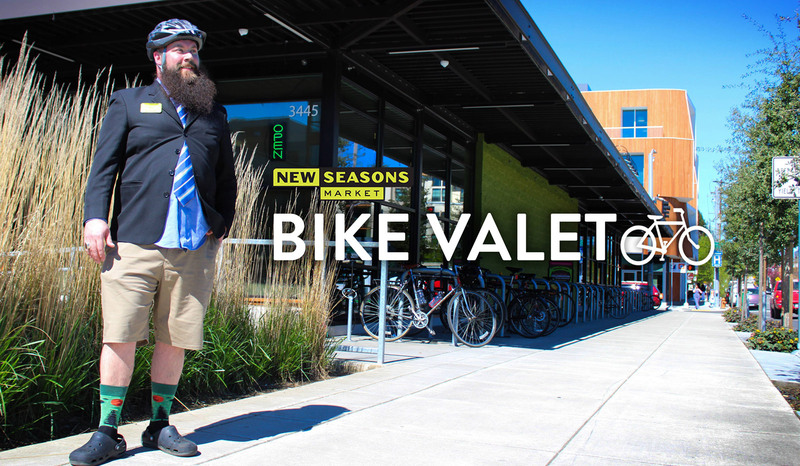 The (mostly) Portland-based business even responds to bicycle-related requests. 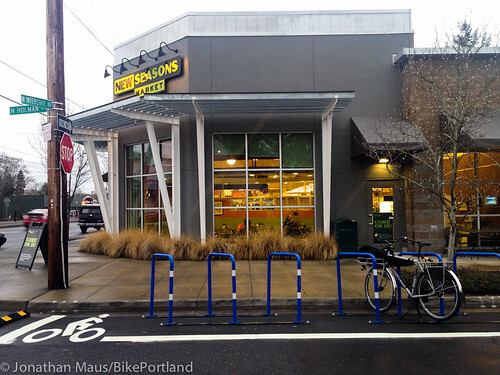 When I contacted them a few years ago about making sure their North Williams Store (situated adjacent to the best bike street in Portland) had great bike parking, they not only listened, they invited to help plan the racks. They even went for one of my crazier ideas: storage lockers for bicycling customers. Now they’ve done it again. 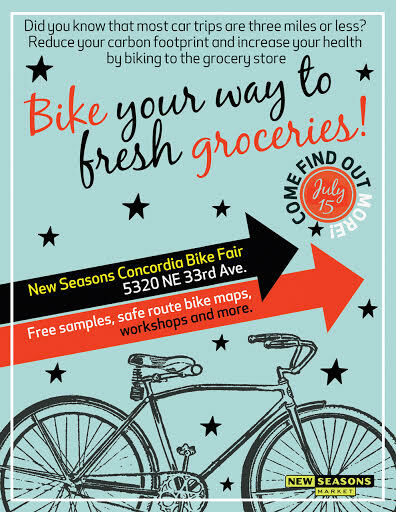 On Saturday, the New Seasons in Concordia (5320 NE 33rd) will host a bike fair aimed at raising awareness of just how easy (and popular!) it is to ride a bike to the grocery story. ‘Safe Routes to Groceries’ was the brainchild of retired Portland optometrist Armando “Jerry” Zelada. 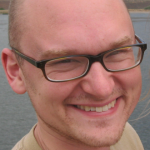 Zelada is a fixture in bike advocacy circles and is former chair of the State of Oregon Bicycle and Pedestrian Advisory Committee. He approached the Concordia store’s community coordinator Tanya Leib with the idea of, “Teaching and inviting people to bike to the store as a way to be active and reduce use of automobiles because we know that half of the automobile trips are three miles or less.” And because, believe it or not, many people still assume it’s impossible to get your groceries home by bike. A sign at New Seasons Market on Williams Avenue. The costs of “free” parking have been hidden inside the price of almost everything we buy, but it’s rare to see an example as straightforward as this one. 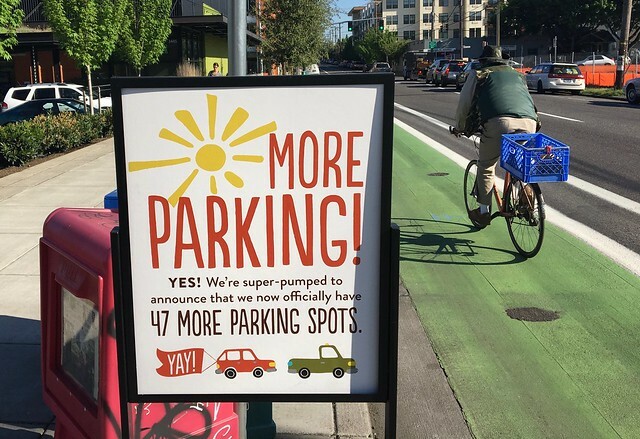 The New Seasons Market on Williams Avenue, which like virtually every grocery store in the city doesn’t charge you to park a car on their property, recently started renting 47 parking spaces from an apartment building across Ivy Street that charges $175 a month for resident parking. New Seasons won’t disclose what it’s paying to rent the new spaces — “we keep our real estate transactions confidential,” spokeswoman Mea Irving said Wednesday — but if they were paying the same $175 per month as residents, those 47 spaces would cost $98,700 a year. New Seasons on Williams now offers complimentary bike valet service (with optional cuddling). 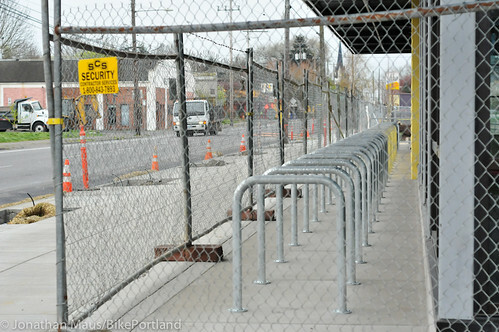 BikePortland doesn’t do April Fools jokes. We just don’t. But that doesn’t mean we don’t appreciate them and we’re certainly not above highlight them. 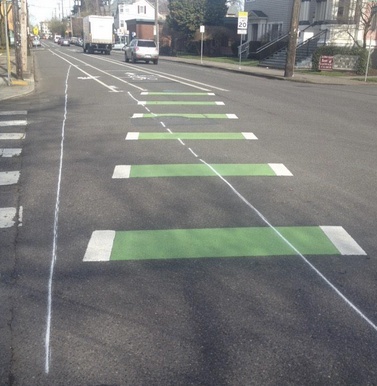 Portland did very well today with bike-themed April Fools pranks. Even a non-bike business got into the act. Check out our roundup below and if you came across other good ones today, feel free to share them in the comments. 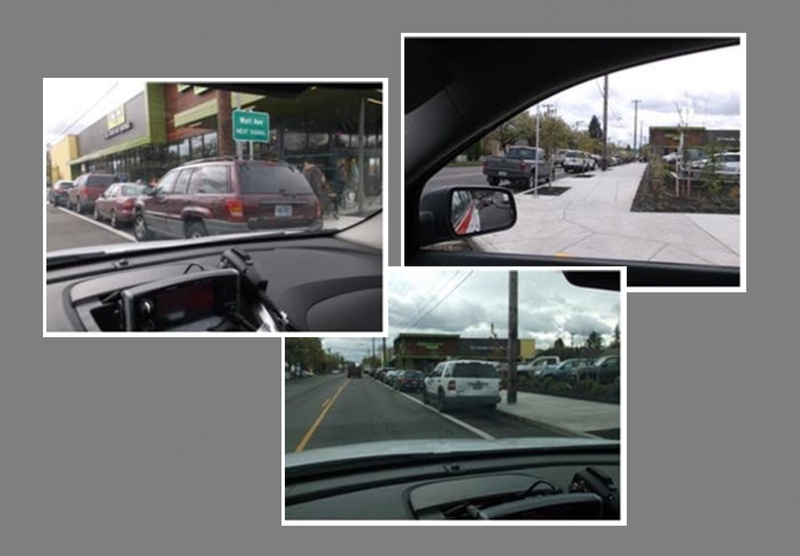 Photos of cars parked in the bike lane in front of New Seasons on Lombard. A new grocery store opened in North Portland’s University Park neighborhood today. Unfortunately customers who arrived by bike saw their new bike lanes full of cars. Franklin Jones of B-Line on one of his delivery trikes. 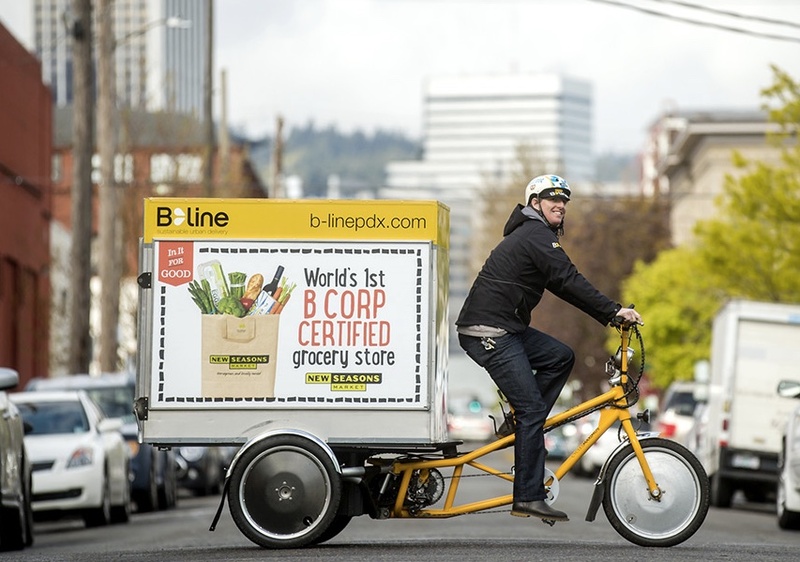 Earth Day seems like a fitting day to announce the latest evolution in Portland’s cargo bike delivery ecosystem. 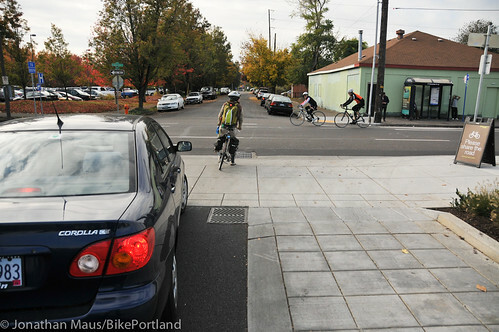 PBOT will move the bike lane over and add a median island at Williams and Stanton. The “three-year journey” (to use the City of Portland’s phrase) to make North Williams Avenue work better for cycling isn’t quite over yet. Riding your bike to New Seasons Market in Arbor Lodge is now even easier with a new on-street bike corral and rear entrance on N. Holman. After hearing about one collision and one near-miss, New Seasons Market has responded to bike safety concerns at their parking lot exit onto Vancouver Ave. Secure gear storage: The next step for bike-friendly businesses? lockers for bike riding customers. One of the advantages cars have over (most) bicycles is a secure, dry, roomy place to easily stash stuff. Take a look at the inside of most people’s cars and you’ll see all sorts of essential and random things in the center console, the glove box, and scattered on the seats and floor. Bikes on the other hand, are usually stripped clean when parked. This is for a variety of reasons including: the threat of thieves who will take anything that’s not bolted down; the threat of rain getting your stuff wet, and so on. For people who bike, there simply aren’t many panniers or similar products readily available that allow you to secure your stuff to your vehicle while keeping it protected from the elements (and yes, I have seen the Buca Boot on Kickstarter). The thoughts above are why I’ve been thinking for the past few years that shops, cafes and markets might want to consider providing storage areas for cycling customers. I’ve pitched the idea of gear storage lockers to a few businesses and I’m thrilled that someone finally took me up on it. be moved further from the wall. It’s always nice to see a retailer going the extra mile to improve their bike-friendliness, and for us, it’s even nicer when the business was alerted to the problem by BikePortland commenters. In this case, the action is coming from grocer New Seasons, which is tearing up and reinstalling a set of bike staples that turned out to be too close to its new building on North Williams.